> For Mac 4,5 & 6 series of mobile phone sets (Of course, if you are a Samsung htc or possible) Love has been very personal side of the thickness of the leather, so it made this leather flat type ~ Therefore, the choice of leather will be thin not thick, but some stiffness primary explants of 1mm thick of tanning (* 6 + Enlarge styles plus cost 300 yuan; open another store; size: 10x16.8cm) > Cover the opening and closing at a specially designed pull-tab, and more convenient to use the opening and closing flap > Case width allows you to simultaneously contain mobile phone shell thickness of the device, so your phone an extra layer of protection - Leather interior surface treatment agent to be pushed to the back of the smooth, not to hurt your beloved phone > The bottom of the holster can choose not to open holes or openings? (Iphone4 or 5?) 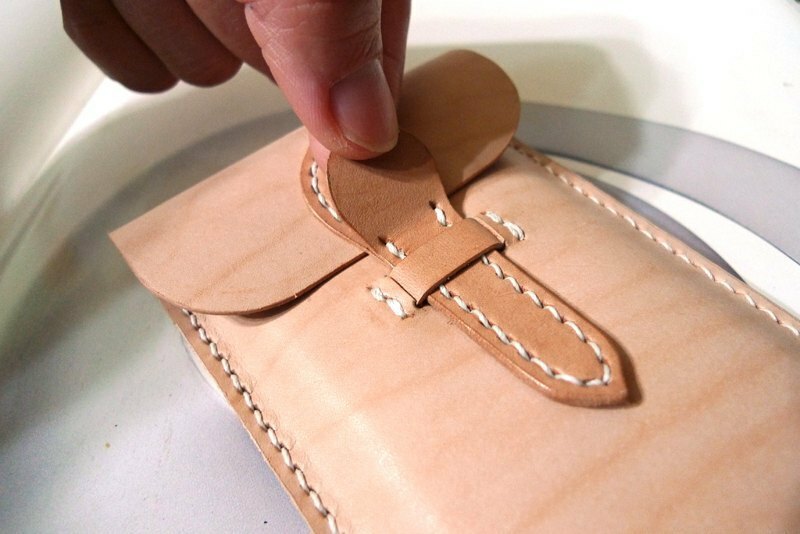 (If not specified not open) > After the top leather, accompanied by a D-ring design, so you always need to be used when the phone hook body (Size: ~ 8.7x13.8cm; flat, non-loaded items measure) * Note: The primary vegetable tanned leather is optional leather sheath itself is rich in high fat cow leather, Visualization personal habits, regular surface wipe leather care oil After a time to slowly develop, will be transformed into a honey-colored, generally referred to as "keep skin" Hand-stitched leather has been loved by friends like! (Do not rub the maintenance of the oil is ok, but the color will be slower to raise some more) * Vegetable tanned leather colors available free imprint of capital name & number; Lively body font for special custom models, non-ordinary workers edition fonts.